What Is a Cruise Ship Nurse? Have you ever wondered what a cruise ship nurse is? You’ve heard of a camp nurse, a school nurse and a traveling nurse. In a way, a cruise ship nurse is a lot like these other nurses. She or he doesn’t work in a hospital but does provide healthcare. A cruise ship nurse also has training as a sailor. Safety and prevention are as much a part of the job as emergency medical work. If you have an interest in becoming a nurse, perhaps you would like to learn if working on a cruise ship would be a good fit for you. Nurses working on cruise ships must have their sea legs. Understanding cruise ship safety and proper emergency procedures is part of the job. 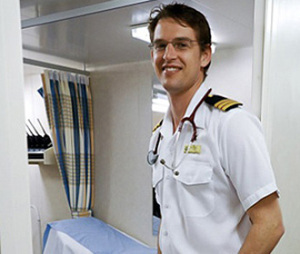 Nurses employed by cruise lines work with a ship doctor or nurse practitioner. They rotate shifts, often working three days and getting the next day off. Working as a cruise ship nurse provides individuals with a love of culture and travel the opportunity to see the world and get to know other cultures. Cruises often include people from many different countries, and their nurse will help them get any necessary healthcare treatment in a manner that keeps them as comfortable as possible. Days off during an assignment can be a lot of fun for cruise ship nurses. If the ship is in port, they have the opportunity to do some sightseeing. Of course, days at sea are always days on call for the medical staff aboard a cruise ship. The team functions as the sole medical emergency responders. They can be called upon for issues such as heart attacks and on-the-job accidents of other crewmembers. They also provide checkups and routine medical care for the ship’s crew. Cruise assignments for medical staff last six months, followed by two months off. Cruise ship nurses must be RNs (see: 30 Best Affordable RN-BSN Degree Programs) and have Advanced Cardiovascular Life Support (ACLS) certification as well. Most cruise lines require nurses to have a minimum of two years experience in critical or emergent care. Since work on a cruise ship requires interacting with people from many different cultures, travel experience or other training in cross-cultural nursing is also a plus. Not only do cruise ship nurses treat people from many different countries, but they are also likely to work with individuals from a variety of national backgrounds. An American nurse on a cruise ship might be part of a team including Irish and Canadian medical professionals. Since terminology and medical lingo varies from country to country, cruise ship nurses must have the ability to learn quickly and understand their international colleagues. Like camp nurses and school nurses, cruise ship nurses see and treat patients outside of a traditional hospital or clinical setting. The job is often fast paced and requires the ability to respond quickly in urgent situations. If you love to travel and like working in emergent or critical care, you might enjoy working as a cruise ship nurse.